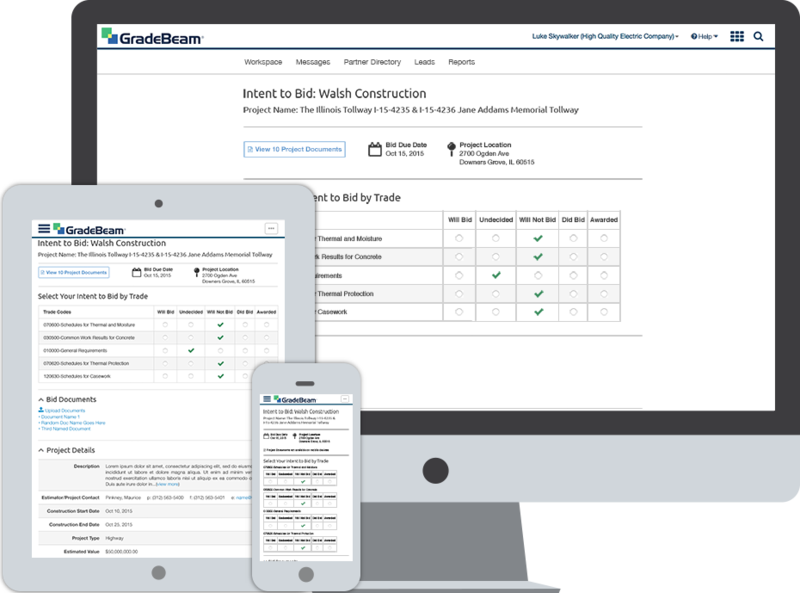 Textura’s GradeBeam application was designed to track, manage and award bids for a general contractor’s project. The first step is the “intent to bid” process. If a general contractor has a project they want to know how many and which subcontractors will bid on a project, or a project’s subset called a package. It is in the general contractor’s best interest to get as many bids as possible so they can assess a project cost correctly. The process I have gathered below is only aspect of GradeBeam. 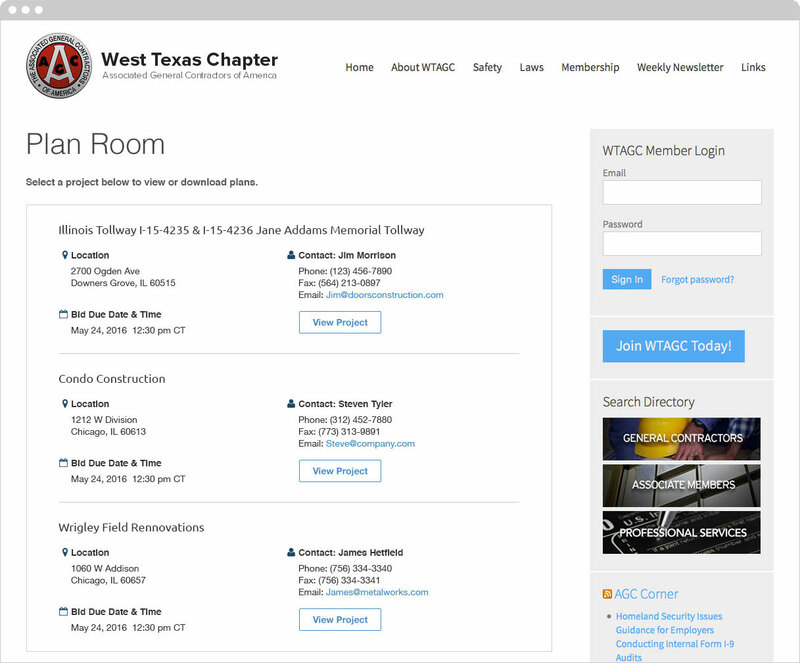 This one is designed to attract subcontractors by posting projects on association websites. These were called plan rooms. They would include links to project details where a subcontractor could review the project and determine if they are interested. 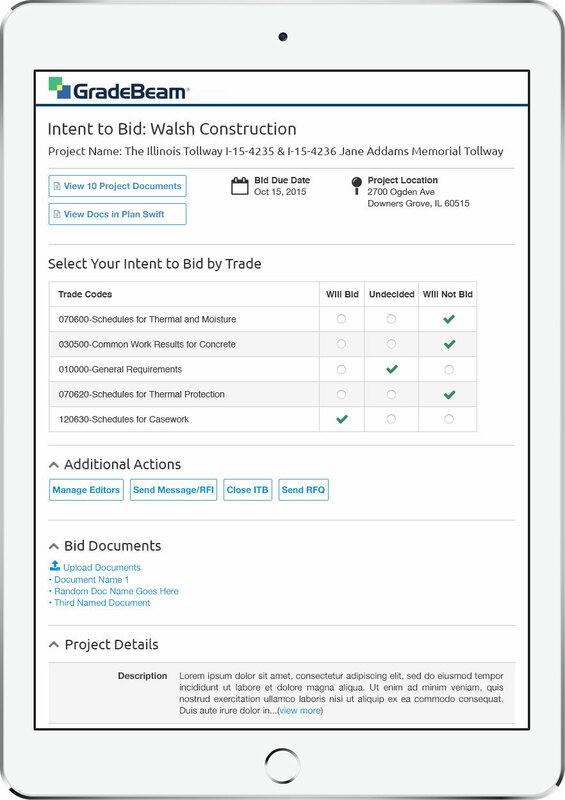 Once a subcontractor decided they want to bid they will request a bid opportunity and will then receive an automated email. This email also doubles as the same email the general contractor sends out to all of their subcontractors. It includes a link to a project bid page that is broken down by trade codes. Trade codes are construction industry standard codes that represent thousands of different trade specific jobs; such as carpentry, concrete, etc. Once a subcontractor determines which trades they want to bid on the results are sent to the general contractor, either trade or organization organizes the results. The bids are organized in a way that helps show how successful the bid request are. By the time I was assigned this project I was very familiar with GradeBeam, its product owner(s) and developers. Normally for a project like this several meeting and white boarding sessions would be required. Luckily, that wasn’t very necessary this time around. I had two or three meetings with the product team, we were able to do the white board and sketch sessions in those meetings. One of the important decisions we made was to make the subcontractor bid pages responsive. A significant number of the subcontractors in our system were smaller shops where the owner or bidder would be regularly in the field. This project was started because it was a request from one of Textura’s largest general contractor clients. The product owner had an excellent relationship with them so as I designed the process he would present the work the general contractor’s team and get their feedback. As always there were a few adjustments. However, the final product turned out pretty good. For the bid process shown here I did a basic "plan room" layout. This was designed to be a basic i-frame with minimal styling so it could blend in with whichever website has added it. If a subcontractor sees an opportunity they are interested in they would click "View Project" and would be taken to a project details page. 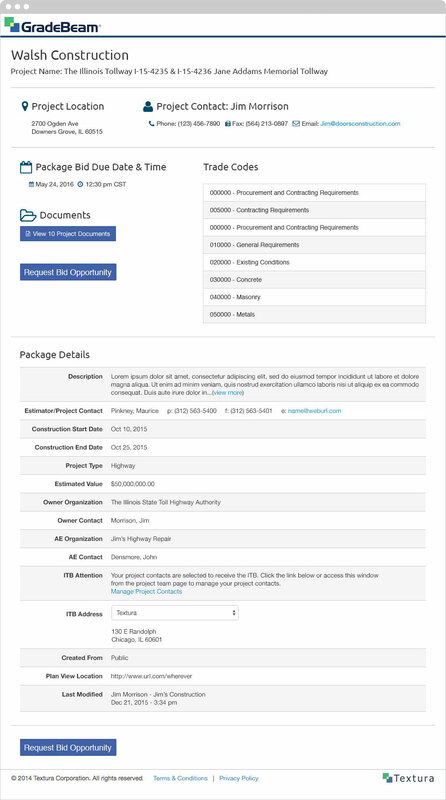 As the title states this is the project details page the subcontractor would see. It contains all the information a subcontractor would need in order to determine if they are interested in the project. If the sub is interested all they have to do is click "Request Bid Opportunity." They will the fill out a form (not shown here) and receive an email with a bid link. A project is what a general contractor creates if they have a job they need help with. A package is a subset of a project. A project can have multiple packages. Packages are usually divided by trades as an easier way to break up the work. This view shows a project with multiple packages. I designed the multiple packages to be expandable as I did not want to overwhelm the user with too much information. 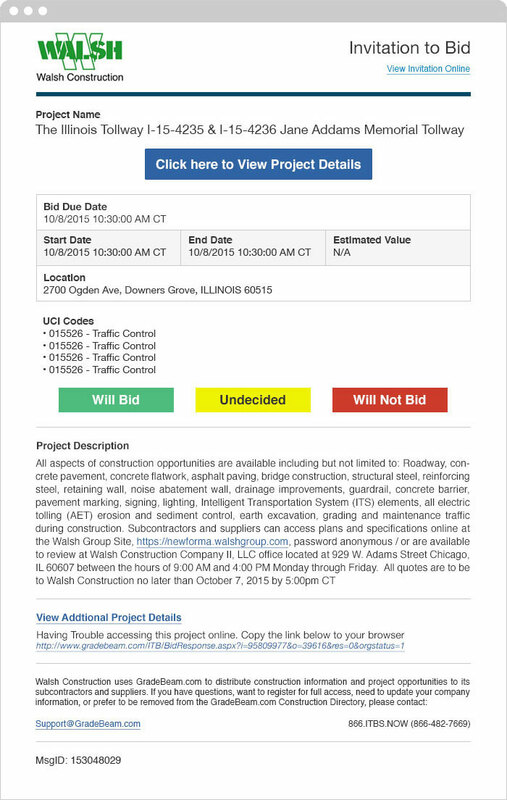 As mentioned earlier, this email layout worked as both the email a subcontractor receives if they request a bid or if a general contractor is looking for subs to bid on a project. The idea was simple, the "Project Details" button and "Will Bid" both take the user to the next screen. The "Will Bid," "Undecided" and "Will Not Bid" send a notice back to the general contractor and is organized into their bid list. The intents to bid are broken down by trade code, the user can simply check the decisions that apply and submit to the general contractor. If a subcontractor changes their mind they can always come back and change their selections. 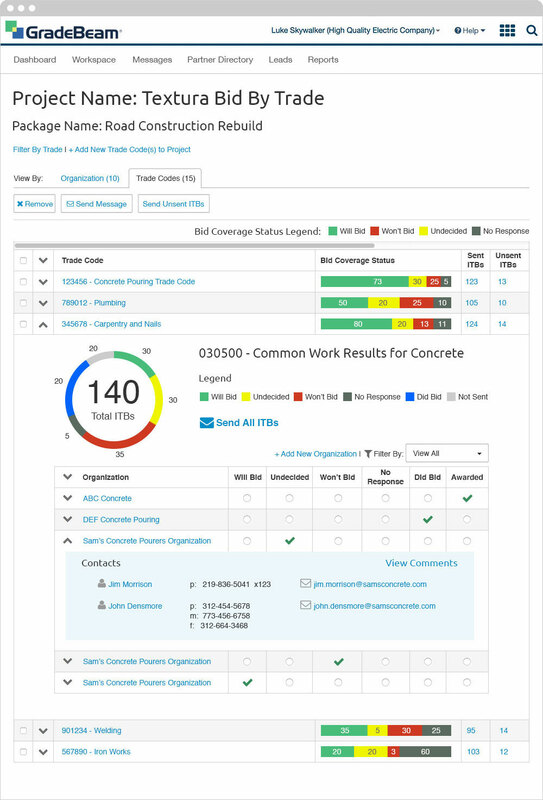 Below the selections are all the same project details as the original project details page. This does NOT include creating the actual bid, that comes later. Once a subcontractor decides their intent it is then sent to the general contractor and displayed in this table. This view is organized by Organization. When the user expands the organization they can see which trades codes they responded to and what their response was. The user also has the ability to see their overall response rates as well as their bid history by trade code over set amounts of time. 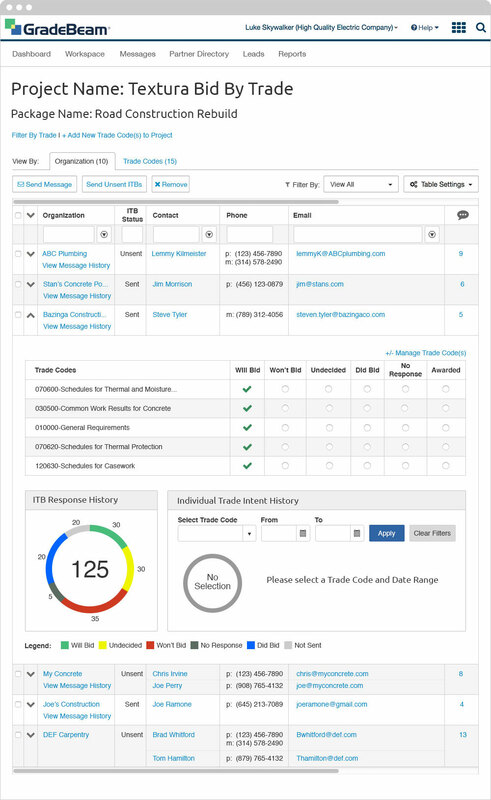 This view is organized by trade code; the user can see at a glance what kind of bid coverage each trade code has received. If a user expands the trade code rows they can how the responses to the intents went. They also have the ability to change a subcontractor’s response if one changes their mind but replies in a non-digital manner. Lastly, from this view they can also expand each organization and get their contact details.